Thank you DICE. AA is in a perfect place. Well done!!! As title states, the AA right now is perfect. Planes can still dominate and rain down hell, and AA can throw it right back at them. The damage is spot on, the guns still heat up fast requiring the AA to slow down the attack. Pilots are no longer dive bombing AA, which is how it should be. Planes that fly high and use caution are staying alive for much of the match. The ones who are brazen skating the ground and think nothing can kill them are getting schooled. This is how it should be. Now if you could just nerf assault against tanks (panzerfaust need to do less damage, dynamite should do nothing to a tank). Stationary is fine, AA tanks are blatantly OP. Hahahaha bs when you can't use a tank to push and just use it to camp, is totally opposite to being OP. The way tanks worked in BF1 was perfect for me and very annoyed that in this game the tanks seem to have Armour with the strength of ply wood. 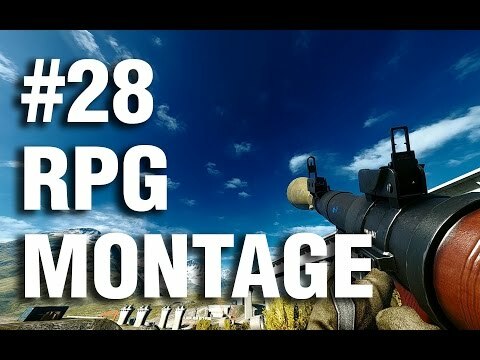 Why push with an AA tank when it has a range of 600m? Armor with the strength of plywood? 2 rockets do 30 damage to tanks lmao. What are you on my guy. There's no need to push when you can just sit at your resupply and decimate planes from across the map. Also OP just said dynamite should do nothing to a tank. Lul ok.
AA? I am talking about the Churchills, Tigers Panzer etc, as soon as try to push into a point as a tank you are swarmed on by Assualt who just own the tanks who can't even move there turret quick enough to counteract the threat. Also is the 30 dmg to the front, side or back? I recommend playing as a Tank in any mode and you will see why tank drivers complain so much. How? Planes can take tanks down in 1 hit and sometimes you don't even hear them coming. Planes can also bomb and take out an entire squadron or more. Planes still have more chance to dominate than any tank or infantry in the game. Seems balanced to me. I have only tried the stationary AA so far and I have to agree. The damage is pretty spot on. You have to lead quite a bit, but apart from that I think it’s well done. Exactly! Its not like you can spam the AA EVEN as an engineer. 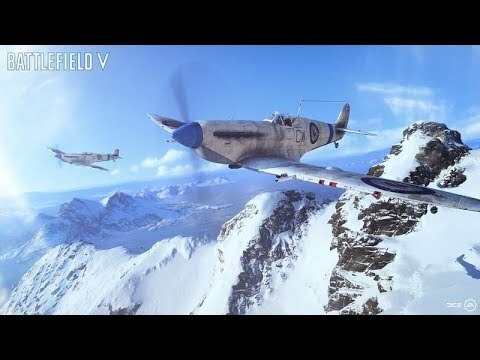 I took on a number of planes last night on Fjell and I could only kill the fastest planes if they already had damage. The planes that did well were the ones that flew below the AA gun, used acrobatic maneuvers to make my aim more difficult, or flew high up out of range of the gun. The ones that got blown up were the pilots who wanted to do a showdown against me, and even then I died in some cases. Stationary AA is still a complete joke, though. Anyone that gets on that thing is a free kill. Right now I'm seeing the German planes go uncontested in the sky because there are no Allied fighters to do anything about them. I just finished a round on Arras and shot down 5 fighters basically from spawn and then they just stopped taking planes out. A fully upgraded AA should dominate, for the most part, the air. AT planes can still easily kill them though, but if the AA plays it smart they can take them out before they explode. Very close match up, which is good. Also, dynamite shouldn't do damage against any armor that's medium+. Non shape charged explosives just explode like a firecracker on your open palm. Subconsciously you're saying that the AA is doing all the work, and you're just happy to defeat something in game that you hate. With this hatred of planes that many players have it isn't about sport, competition or even playing the game. It's all about satiating a hatred towards something in-game which you are unable to deal with by competing fairly. It's an itch you couldn't scratch. So now the devs have pathetically caved in and given you what you wanted, like a parent spoiling their ungrateful sprog. Never mind about learning to overcome obstacles by playing games and sport. Instead, here's the easy way out. Spoken like someone that doesnt fly very often and likes to camp in the spawn with an AA Tank because it can shoot across the map. The only Bomber capable of taking out an AA Tank in one go is the JU88. However the chances of the plane winning are lower than the other way around. The British Bombers dont stand a chance against any Tank. Even the T34 is not a guaranteed kill with 4 Bombs. Planes that fly high are useless to the team because they cant see **** let alone bomb efficiently. The AA Tanks need to be nerfed again. Panzerstorm is impossible to play as the British now with 2 Wirbelwind in the Enemy spawn. 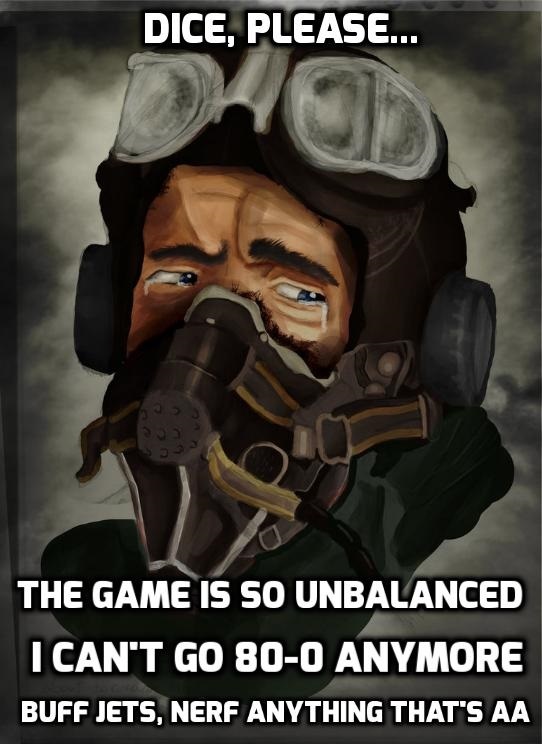 DICE still doesnt know **** about balancing anything. I've only been killed once by a plane today and that was on Fjell. I really like it, and honestly do not care if the AA is overpowered as long as they are looking into the sky doing their job and I am getting pestered on the ground by two vehicles less. Your rant is childish, immature, lacking evidence and/or facts and comes across as a child who did not get their way. Go cry more. Now that my rebuttal to your lame commentary is out of the way, lets act like adults. I am a designer by trade (and I have worked with devs with personal correspondence to help balance/design their games). I approach problems as objectively as I can to appeal to the greater audience of the project. Balance and fairness are assumed by players in just about any game made. Balance is when its good for you and good for me, but that does NOT mean that you will always win, nor does it mean that I will always win. The fact is that planes were completely dominating the game. 1 shotting tanks, 1 shotting entire squads or more. Day one of the first January patch planes were going 75-3 or greater, is not contestable. Its a well known fact and that was not good balance. Sure the pilots of the planes who could simply NOT be shot down by any form of AA whatsoever, had a great time...but what about the tanks or infantry who were getting blown up, out of nowhere regardless of their focused attention in game. Plane balance/lack of AA balance was simply dominated by one side. If you can't see that, you have no business suggesting that something is broken. Your bias is for what you desire, not for the greater good. Stationary AA right now is in a perfect place. You can still get mowed down (which frankly should not even happen), and it takes at least 2-3 rounds of solid hits to take down the weaker planes, unless they are charging right at you, then it takes 2 rounds (with the associated cooldown due to over heating). Mobile AA does feel strong, but they should be. A bomber can 1 shot anything in game. Mobile AA can not do that, they have to get a round or two off before they can destroy a plane. Good pilots who know how to dog fight and do aerial maneuvers are hard to hit for most players. Seems balanced to me. I was in a Flak Panzer yesterday, actually 7 to be exact in ONE match in order to take down 10 people, just 10 because I was constantly blown to pieces by infantry. Are Flakpanzers strong against planes? Yep, they sure are but it takes the same amount of time for infantry to blow up a flak panzer as it does a flak panzer to blow up a plane. When I see a plane dominating, I call for someone to take it down or I do it myself IF I am able to get into a tank. 9 times out of 10 that does not happen and I have to get into a stationary AA, usually dying a few times just running to the AA. You act as if everyone has a flakpanzer in their pocket and the battlefield is littered with them, but that is not the case and as I already stated more often than not there is not even one on the field and if there is, it usually gets annihilated by infantry. This is why people camp at their spawn points, in hopes they actually get to use the vehicle. When tanks and infantry are balanced, then I would suggest we revisit mobile AA's strength against planes, but right now overall the game is in a balanced state. I am sorry you feel the need to fly in your 1 plane the whole match to get 85 kills for epeen bragging rights (that no one cares about), but I don't care about your feelings, I care about a fun and balanced gameplay that appeals to a wide variety of people to ensure a healthy player base exists for all. Right now attackers are totally screwed.. as Defenders have more AA guns and are harder to shut down.. the Defenders can all spawn bombers and smash the already disadvantaged attackers. If you go after the Bombers in fighters they just circle the rear area right behind there front and the defenders AA blows the fighters out of the sky. This update totally screwed Attacker/defender game play. Giving even more power to the defender.. It's like Dice doesn't even play there own game or have a clue how to balance attacker/defender game play. Yeah, but players are not skilled anymore. They need to be able to kill planes in a flash with very little aim required while drinking a beer. New generation. New players. Enjoy. yeah lets require infantry to use "skill" (read, mostly luck) to hit an object moving in 3 dimensions at 400mph with a dumbfire rocket that's much slower than the plane but give planes a big third person circle where their bombs will easily OHK slow moving infantry/armor and a 5m beaten zone on the machine guns so you don't even need to aim carefully like say the BF4 stealth jet.